Didn't get the email? Try checking your spam folder. An account for your organization already exists with us. Check your email from Reputada to complete registration. Reputada is powered by Reputada. Use Reputada to engage customers and collect accolades. Publish your accolades to Reputada. Ongoing Feedback. Continuous Improvement. Happy Customers. Gain customer satisfaction insights that is critical to retain customers. "...so just looking at numbers isn't everything. What you really want is why we are down 10%." Monitor and improve internal team performance. "We need constant evaluation, like a sports player." Free for one user and up to five customers! Our out of the box solution is specially designed for B2B services. It enables frequent and timely feedback that surveys don't. You hear the unfiltered voice of the customer. Customer feedback is converted to an aggregate rating. You can compare where you stand in the eyes of different customers. Customer satisfaction trends become visible. You can identify in which areas of your business, your customers are pleased with and in which areas, you may need improvement. This aggregate view allows you to align organizational behaviours with business objectives. Sometimes, the most important feedback is negative. Reputada automatically makes critical feedback visible to relevant stakeholders in your organization allowing for quick action to be taken. A built-in resolution process helps you respond to your customer's concern and conclude it to mutual satisfaction. Request feedback anytime you want. Send automated requests by integrating with your Ticketing/Task Management systems. This will send requests at the end of every Ticket/Iteration. Integrations Supported: ConnectWise, ServiceNow, and Jira. Customers can give unsolicited feedback anytime they want. Add a feedback request link to your Email signature, Website, Social Media channels, etc. Reputada allows you to control the context and visibility of the feedback recieved. Sign up and you will be all set to get feedback from your customers. In fifteen minutes we can show you how to increase customer feedback. How can we reach you? Please provide the following information and we will get back to you soon. Reputada's ability to collect periodic feedback on customer experience, with unexpected ease, enables us to stay closely aligned with our customers. 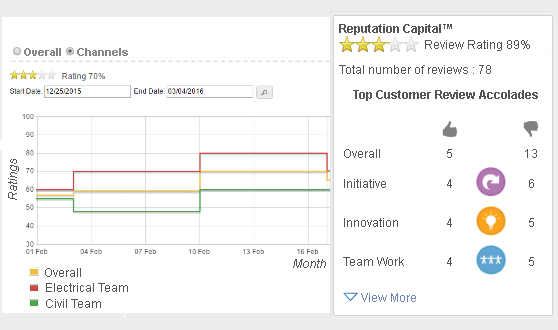 Our Reputada Reputation Page is a great asset to our sales team as they engage with potential customers, and has also resulted in higher motivation and ownership among the entire team. 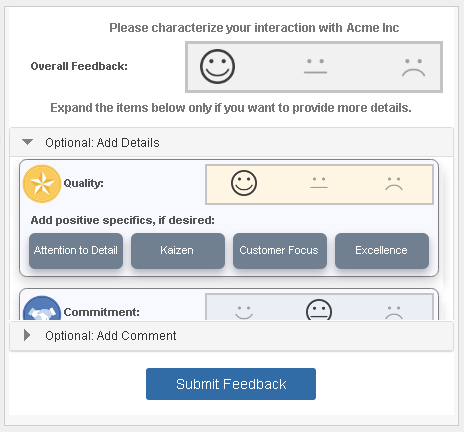 Unlike lengthy customer surveys, micro-feedback consists of a simple rating and a brief comment from a customer in the context of an ongoing dialogue. Why do I want micro-feedback from my customers? Use micro-feedback to assess customer sentiment in an ongoing way during an engagement or interaction allowing the relationship to be kept on track. Why do I want to give micro-feedback to my vendors? Align vendor behavior with customer expectations. My team uses Agile methods, don't we already get customer feedback? No. Agile teams get technical feedback on their deliveries. The customer might be OK with the technical aspects of a delivery, but not like the level of communication or innovation and might be planning on terminating the project early or doing a follow-on project with another supplier. You need customer micro-feedback in addition. Start by defining customer experience as the sum of all interactions a customer has with a company. We are in a business era that is dominated by the customer. Customers have become more demanding. They are not willing to put up with excuses. Many B2B Service Companies Use Ad Hoc Feedback How do you know how things are going with a specific customer?